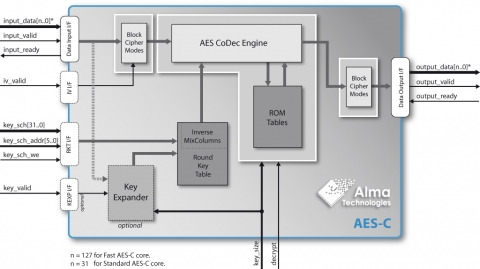 The Alma Technologies AES-C core implements the FIPS-197 Advanced Encryption Standard. It can be programmed to encrypt or decrypt 128-bit blocks of data, using 128-, 192-, or 256-bit cipher-key. An included configurable wrapper surrounds the AES-C core and implements its fixed Block-Cipher mode of operation. This configurable wrapper supports the ECB, CBC, CFB, OFB and CTR Block-Cipher modes. The AES-C core is available in two variations, the standard AES32-C and the fast AES128-C: AES32-C has a 32-bit internal datapath, while the AES128-C uses 128-bit datapath. The AES32-C variation is more compact in size, but offers a lower throughput than the AES128-C. The AES32-C needs 44/52/60 clock cycles to encrypt or decrypt an input block using 128/192/256-bit cipher-key, respectively, while only 11/13/15 clock cycles are required for the same by the AES128-C core.